Earlier this year, Comcast started testing prepaid Internet service for consumers in the Philadelphia area. Now the nation’s cable provider is trying out a prepaid (non-HD) TV service that offers a few dozen channels (but no ESPNs, Nickelodeon, or MTV) and costs anywhere from $15/week to $45/month. According to Comcast’s website, there is an initial charge of $69.95, which gets you a little digital adapter box, a remote, some coax cable, and some batteries for that remote. It does not enter you into a service contract, but that does include the first 30 days of service. After that, users pay as you go, starting at $15 for seven days or $45 for 30 days. Comcast says that there is no credit check and your Social Security Number is not asked for as part of the ordering process. The biggest drawback is that the service is not available in HD, which is okay if you’re hooking the box up to an old TV but not so great if you’re using anything bought in the last few years. While we’re pretty sure this isn’t an overt attempt to lure back cord-cutters, not offering HD service certainly isn’t going to help bring any of those people back into the fold. Obviously, the market Comcast is going for here are people with spotty credit and people who are concerned about getting cable service for fear of being locked into a multiyear contract — a contract that only guarantees you remain a customer, not that prices won’t go up. At least with prepaid, if the price goes up, you don’t keep the service. It’s a little unclear as to how widespread this service is. 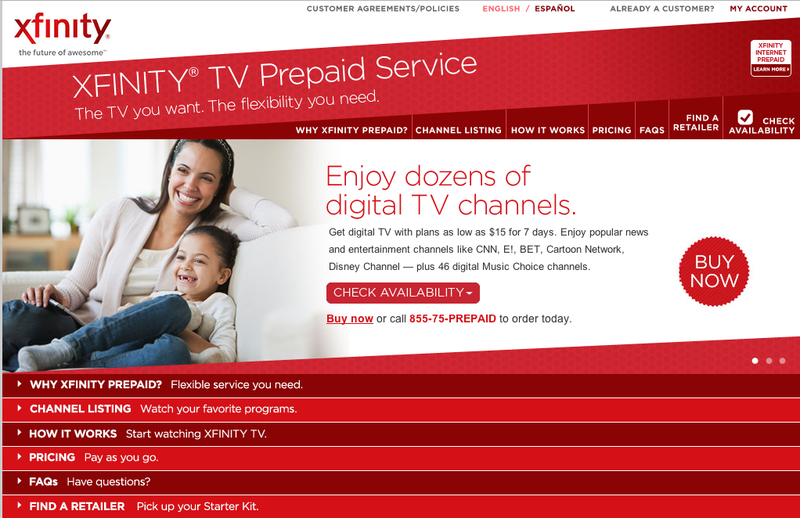 Multichannel.com reports that it’s only in the Detroit metro area — and the only channel listings shown on the prepaid service’s site are for Detroit viewers. However, when I entered in my Philadelphia address, the site said the building was eligible (which is not a shock, as I live almost in the shadow the gleaming Comcast tower).